On Blu-ray/DVD TODAY: "Batman: Gotham By Gaslight"
“Batman: Gotham By Gaslight,” the 31st film in the ongoing DC Universe Movies series, arrives TODAY on Ultra HD Blu-ray Combo Pack, Blu-ray Combo Pack and DVD courtesy of Warner Bros. Home Entertainment. The film had its Los Angeles premiere on Monday night (2/5/18) at The Paley Center for Media in Beverly Hills, CA. 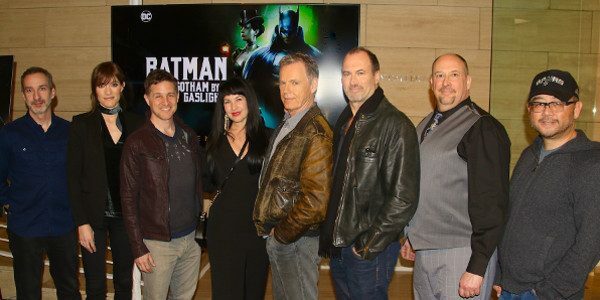 In attendance was the core cast — Bruce Greenwood (Batman), Jennifer Carpenter (Selina Kyle), Scott Patterson (Commissioner Gordon), Yuri Lowenthal (Harvey Dent), Grey Griffin (Sister Leslie) and William Salyers (Hugo Strange), as well as producer/director Sam Liu and screenwriter Jim Krieg. The post-premiere panel was moderated by IGN’s Laura Prudom.